some of you have asked about our little ceremony we had on Isabela's due date -- here are some photos from that day. we got up early, went to the ocean, and paddled out beyond the break. 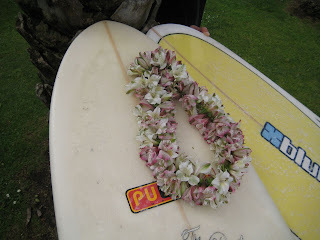 Thomas had made a lei of flowers, which we cut apart and scattered on the waves. 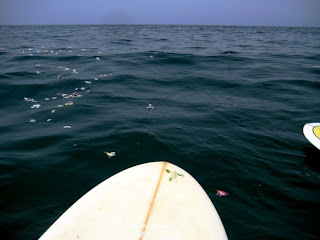 we said goodbye, watched the flowers float away, and surfed for awhile. it was very healing, and even a joyful time. especially meaningful was that also, there in the waves, Thomas also gave me a beautiful necklace with quite a backstory from Rome to commemorate the day. since then, i have felt a sort of slow dissolve of the hard spiky stone called grief that always seemed to be rattling around inside my heart. yes, i still have some days where the sadness or disappointment is more keen -- and i know i always will carry that spiky stone -- but i would like to believe that it will be easier for me to choose hope as the stronger emotion as i heal and move forward. we thank you for the incredible outpouring of love and support that you have shown us -- you are truly conduits of God's compassion. i heart these photos so much. i will have to keep them...i wish i could have been there in a way even though i realize it had to be a private ceremony. i agree with katrina, btw, that you should write more about your experiences and publish them...i would love to see this one in redbk or real simple's personal essay section if not an article...as i would the most recent one you wrote. btw, tt's lei is so beautiful!!! sooo impressed. his secret hawai'ian gene, perhaps?